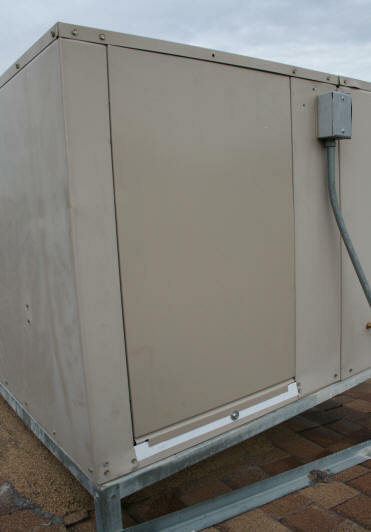 This page will cover specific issues that I have had to deal with regarding my evaporative (swamp) cooler. The type of evaporative cooler I have is the Champion Master Cool, Model ADA71. It was purchased May, 2011 at Lowes for $629. If you are looking for information on the best float valve on the market for your swamp cooler, you can stop looking now. There isn't one. 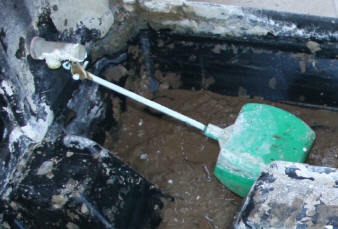 I have spent hours searching on the web for the best float valve that will actually cut off the water and not leak. I would spend big bucks to have a float valve that lasted more than one summer. They just do not exist. All there is, are these cheap valves, made by a couple of companies and none of them are perfect. So.....I will discuss the float valve I found that works best for me and my cooler. And...it has its faults. And yes, it cost more than others. 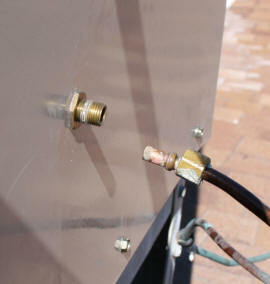 The float valve that I am now using is the 1/4 inch, Dial Evaporative Cooler Bronze Float Valve. Model 4161. Available at the Home Depot. I purchased it at the store. 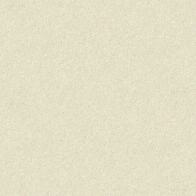 Not online. The valve is pictured to the right. This particular valve comes in two sizes. One with a long arm and another with a short arm. The short arm does not work for my cooler. For some reason, Lowe's only carries the short arm model. So I had to travel further to a Home Depot to get the long arm. 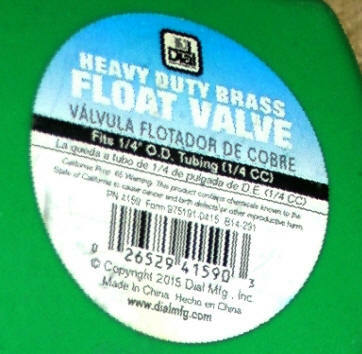 I do not purchase float valves online because I want to make sure the valve closes all of the way. You can only see this in person. See photo to the right. If the valve does not close all of the way, water dribbles into the cooler and eventually overflows. I do not have a hose connected to my overflow hole so this water drips off the roof wasting water. All of the other cheaper float valves I have bought, do not close all of the way. When I try to install them, sure enough, they do not cut the water off like they should. 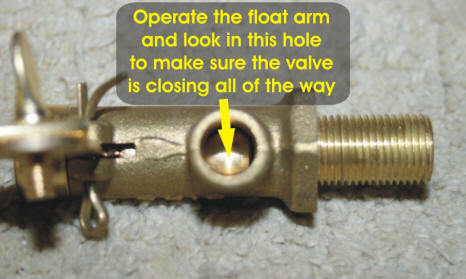 When you purchase a float valve make sure all of the parts are there. The Home Depot I purchased my float valves from, had them in a large bin. Many of the washers and nuts had been removed. There should be the valve float itself and a washer and nut, which is used to hold the float valve tight against the cooler wall. There should also be a sleeve and nut that is attached to your tubing. This is then attached to the float. See photo below. 1) Turn off the water to the cooler at the source. 2) Remove the tubing from the end of the valve. 4) The float valve can now be pulled through wall of the cooler and removed. 5) Install the new valve reversing the steps above. Make sure the washer and nut hold your new float valve firmly in place against the wall of the cooler with the water spout facing down. 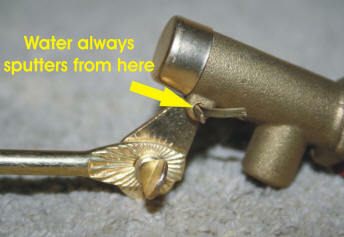 To adjust the arm of the float valve, you just loosen the screw, and adjust the arm. To tighten, use pliers. Where to adjust it? Trial and error. You want enough water in the reservoir to keep water being pumped up over the pads. But you do not want the water overflowing. You have to play with it until you get it right. I start with an inch in the reservoir with the pump running. If I turn off the pump and the water overflows when all the water comes off the pads, then I need to adjust the float valve down a little so it cuts the water off sooner. Water spout on valve should be facing downward when installed. Move float arm by loosening arm screw. Use pliers to tighten this screw snuggly. 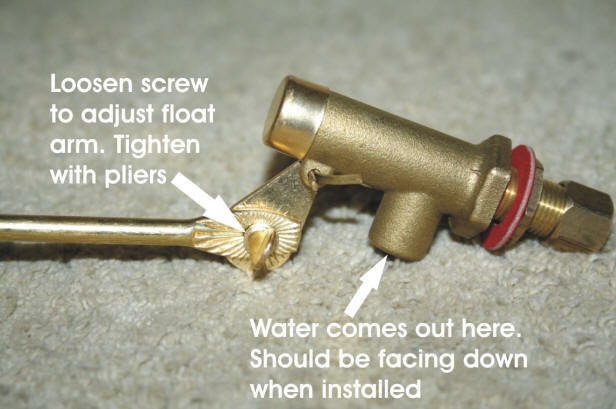 While this particular valve does a good job of cutting off the water, it has a big problem. Spurting water from one area. For some, this would not be a problem. For my cooler, this spurting of water hits the blower housing which means I have water dripping into my ducts. The fix for this is to take a small rag and drape it over the spout section of the float. 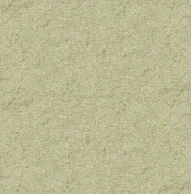 The spurting water no longer sprays in the air and into my ducts. Water always sputters out of one area on this particular type of float valve. Cover spout section with a rag to keep water from getting all over the cooler. Do not throw away the brass section of your old float in the trash. You can get money for them at a recycling center that buys scrap metal. I just keep the old brass and copper fittings I acquire until I have a few pounds of it, then take it in. The access panel on the east side of my cooler, that I use the most, was damaged during the winter of 2012. Somehow it blew off the cooler and off of the roof during some high winds. This is now the reason why I place a cover over the whole cooler when it is not being used. Access panel secured with bungee cords temporarily. During late August of 2016 the cooler was not blowing cool air. As soon as some seasonal rain cleared out, I climbed up on the roof, to discovered why. The stupid panel had blown off again, but the screws on the bottom at least, kept it attached this time. 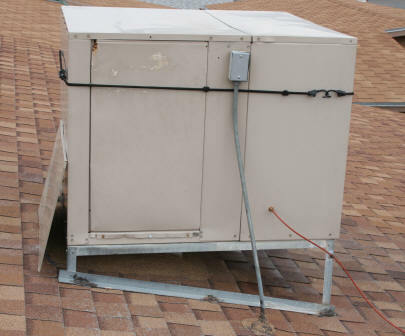 If your cooler access panels are not closed, you will not have cool air blowing in your house. I took the panel off and used pliers to straighten out the metal as well as I could and bungee corded around the whole cooler to keep the panel from coming off again. Time to look for a new access panel. Easier said than done. This type of part is not easy to find. Since I had the manual I knew the part number. The manufacturer does not carry the parts. I found only one website that carried these parts. That is it. The website said it had 2 access panels in stock. I took a chance and ordered a panel. I half expected a phone call telling me that they really didn't have the panel and it was no longer available. But no, they actually had the panel and I received it 5 days later. I was very pleased. I initially needed to check out the website because it felt a little "off" to me. It ends up that this website is part of a larger company called Appliance Factory Parts out of Denver, CO. So if you order from them, the e-mail correspondence will be from them. Something they should mention on the Cooler Parts World website. 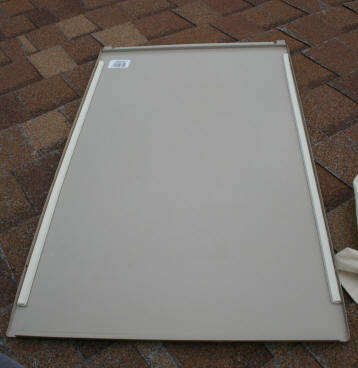 The panel is held in place on the bottom by two flaps on the edge. However there is always some rattling in strong winds. So I placed some stick-on weather stripping along the long edges to cushion it. At the very bottom of the opening, where three screw holes had been drilled to keep the damaged panel fastened. I covered these old holes up with a strip of white duct tape to keep the rain out. New access panel in place on cooler. And because I don't want to lose this panel after spending $67, I placed one screw with a washer holding the edge at the bottom. This will hold the top part of the panel in place under the ledge at the top of the opening. To access this panel, I only have to remove one screw instead of the 4 that were holding on the damaged panel. Oh....and it looks much better now.